DURHAM, N.C.—For the Hampton Lady Pirates’ basketball team, who had their rotation ravaged by major injuries throughout the season, winning the MEAC, let alone making it to the NCAA Tournament, seemed like a long shot. In their NCAA Tournament matchup against No. 2 seed Duke on March 18, the No. 15 seed Lady Pirates knew what they were up against and, much like they had all season, did not shy away from the competition. While the stats may not have suggested as much, the Lady Pirates got after Duke. Using their signature hard-nose defense, they forced them to commit 19 turnovers, their highest since March 3 against Syracuse. Leading the way for Hampton into Durham was the versatile Jephany Brown, a junior transfer from Walters State Community College in Tennessee. Nine days after posting a career-high 18 points against Maryland Eastern Shore in the MEAC Tournament, the Washington, D.C. native attacked Duke’s formidable frontline, scoring 18 points, grabbing three rebounds and adding two steals. Now, a couple short days removed from the big game, Brown has had more time to reflect and she sounds even more ready for next season. “I wanted to help my team try and beat Duke and send the seniors out by shocking the world but we fell a little short,” the poised Brown said as she expressed the passion she has for her team. “I just wanted to compete and show that I could play on the next level,” she continued. Brown made her presence known immediately after tipoff when she made the game’s first basket, a 3-pointer from the right corner.When she converted on a layup with 4:39 remaining in the first quarter, the Lady Pirates were only down 9-6. 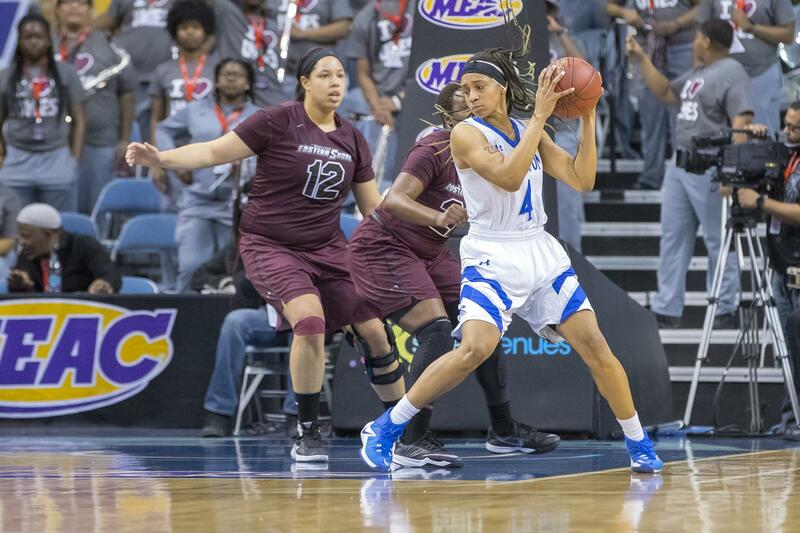 Her effort managed to keep the Lady Pirates’ ship afloat early but, at halftime, Hampton trailed 48-10 and Duke went on a devastating run that essentially lasted until the end of the game. Following the contest, Brown sat alongside her head coach David Six to discuss what the outcome meant to her at the press conference. “It just motivates me to work harder. I played a good game, but I didn’t play my best. I haven’t played my best all year,” Brown shared. “It motivates me to work on my game and get my teammates involved so we can repeat this same process with a different outcome,” she said. After dealing with nagging injuries of her own all season, Brown proved to be a big part of the Lady Pirates’ incredible title-winning run. Of the 28 games she played, Brown started in 23, accumulating 590 minutes and averaging 21.1 MPG, the sixth-most on the team. She shot the second-best free throw percentage on the team at 73.1 percent, behind fellow hybrid Monnazjea Finney-Smith, who shot 80 percent. Brown also averaged seven points and four rebounds; was fifth on the team in steals (35); and was second on the team in blocks (24). Brown figures to be a primary player in Coach Six’s schemes next season as they prepare to lose seniors Chanel Green and two-time MEAC Player of the Year Malia Tate-Defreitas, who both could not play against Duke; as well as the reliable Georgianna Gilbeaux. But Brown feels the program will bounce back to turn this minor setback into another monumental year. “I feel great being with a great group of girls and great coaching staff. It will motivate me to work harder for my sisters so that we can chase another ring together and have a better season even though this year was a great year, “ she noted. Hampton Nation better keep close watch on Brown and the Lady Pirates’ journey as they attempt to win Coach Six his seventh title in nine years.